MPL announces an expansion of this rugged Switch Family. The new products is 10-port switch that includes two 10Gbit SFP+ ports and still conforms to MPL's high standards like; long-term availability, extended temperature capability, flexibility, and low power requirements. 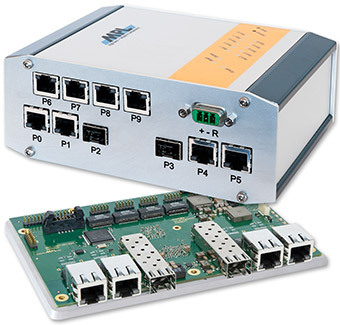 The new switch called MAXBES integrates 8-ports with 1Gbit and 2-ports with 10Gbit speed. The eight 1GBit ports are either available on RJ45 connectors or four RJ45 connectors and four 1GBit SFP next to the two 10Gbit SFP+ ports. The open frame version is available with lockable headers instead of RJ45. All ports have status LEDs on the front-plate, indicating the activity of each port. The MAXBES solution is extremely compact and is built in a rugged aluminum housing or as board level product The input power requirement of the device is 8 -36VDC and comes with reverse polarity protection (optional with redundant input) and less then 15W power consumption at full operation. The product can be operated at -20°C to +60°C. All on market available 1GBit Ethernet compatible SFP transceivers (according MSA) can be used. It allows the users to select the appropriate transceiver for each link. The SFP+ Slots supports 10GBit and 1GBit Ethernet compatible, MSA compliant SFP+ Modules. Integration of IGMPv3 support and Port trunking is planned.